Following the announcement earlier this week that Nintendo and Namco Bandai had signed a distribution deal for Solatorobo: Red the Hunter, the former has today confirmed that the Nintendo DS title will release on July 1st in the region. 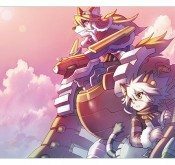 Solatorobo: Red the Hunter offers players the chance to enter a world of epic fantasy action as they venture across the mythical floating islands of the Shepherd Republic. You’ll take on the story of Red Savarin, an anthropomorphic dog with the ability to take a human form, as he does battle with giant robotic “mecha” and other enemies as he explores the floating islands. This engrossing quest is set amid picturesque anime graphics produced by some of the world’s leading animators and manga names such as Nobuteru Yūki (The Vision of Escaflowne) and movies and cut scenes designed by Madhouse (Marvel Anime, Ninja Scroll, DeathNote, CardCaptor Sakura).